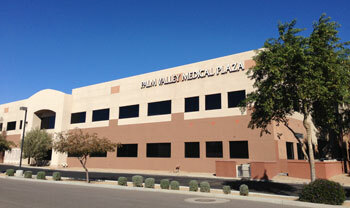 Our Goodyear office is conveniently located in the Palm Valley Medical Plaza near West Valley Hospital and serves patients in Goodyear, Avondale, Litchfield Park, Buckeye, Tolleson, Tonopah, and the surrounding Phoenix community. Located adjacent to West Valley Hospital, our building is on the right side when turning into the hospital entrance from 136th Drive. Unsolicited advertisements are not accepted at this fax number. From Interstate 10 take N Litchfield Rd north. Turn right at W McDowell Rd. Turn right at entrance to West Valley Hospital at 136th Drive. We are the first office building on the right.